For additional camera settings, refer to the moto e4 user guide. Tap the HDR icon to selct an option (On, Off, Auto). 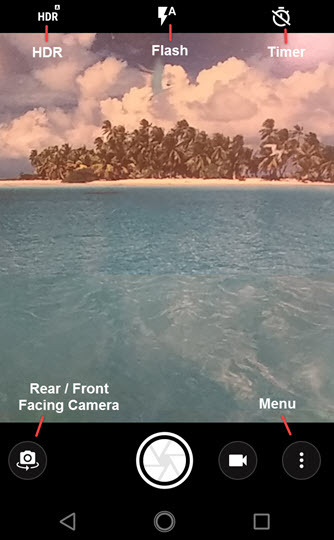 Tap the Switch Camera icon to switch between rear and front camera. Tap the Flash icon then select an option (On, Off, Auto). Tap the Video icon to use the camcorder. Swipe from left to right on the camera screen then tap Storage. Option is only available if a memory card is inserted. Swipe from left to right on the camera screen. Depending on which way your camera is facing, photo size options vary.